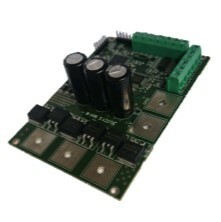 Four brushless DC Quadrant motor Controllers provide exceptional control of brushless motors, allowing for controlled delay and acceleration in both directions. All of our 4 quadrant controllers are developed and manufactured in the UK under the QM AS9100 system to ensure the highest possible quality. interface with simple speed controls such as pots or signal voltage of 0-5v or with more modern communication options such as UART, RS485 and more. If you need to work with a certain type of communication protocol, then talk to our team today about what you need and see how we can help you.